The Greater Manchester Track & Field Championships took place at Bury on Saturday 13th and Sunday 14th of May with a contingent of ECH athletes competing. On day 1 George Lewis had a great run to win the senior men’s 1500m in 4.12.84. Kane McWatt was another Gold medallist with a fantastic run to win the under 15 boys 300m in 39.92. Melanie Lee made it a hat trick of Gold’s for ECH winning the senior women’s hammer final with a throw of 34.07. Megan Lewis won a brilliant silver medal in under 17 women’s 1500m final with a time of 4.59.87. Dylan Boys-Massey also won a silver in under 20 men’s discus with a great throw of 24.33. Anaya McDonald won a superb Bronze medal in under 20 women’s 100m with 13.19. On day 2 from the 15 athletes competing, we collected the following medals: Emily Bowker won an incredible two Golds in the under 11 girls 600m and 75m with times of 1.53.72 and 11.56 respectively. James Harney won a brilliant Gold in the under 13 boy’s High Jump with 1.25m and a solid Bronze in the 1500m with 4.54.45. Ehi Itua won a fantastic Bronze in the under 15 boy’s 100m with 13.11. George Lewis won his second Gold of the Championships in the senior men’s 3000m steeplechase with a time of 10.21.42. Megan Lewis was in the medals again but this time a superb Gold medal came in the under 17 women’s 1500 steeplechase with 5.45.62. Abby O’Neill won a Silver medal in the under 17 women’s 800m with 2.24.45 and Bronze in the Javelin with 29.63. Katherine Waters won a Bronze in the under 15 women’s discus with a throw of 16.74. A brilliant and successful weekend with good performances and personal bests, well done all. 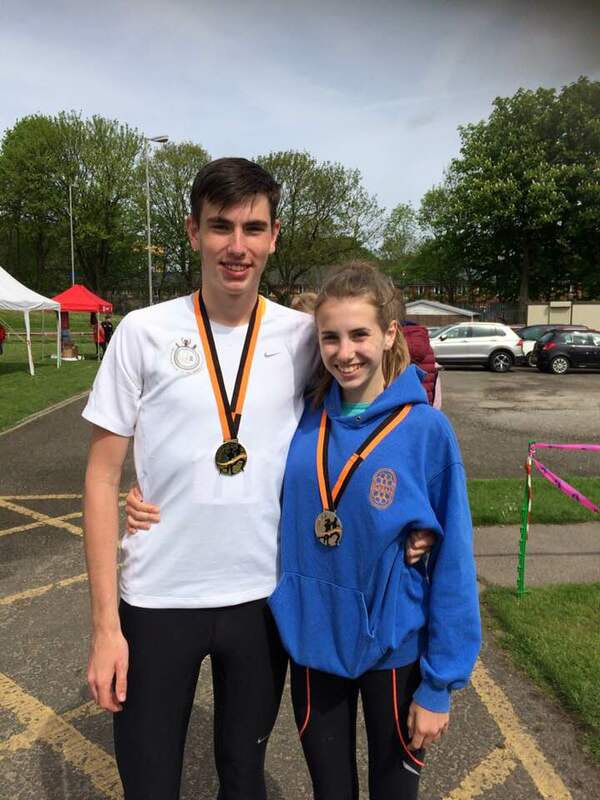 Photo – George Lewis and Sister Megan with their medals.